SOLD INDIVIDUALLY, NOT AS A PAIR. 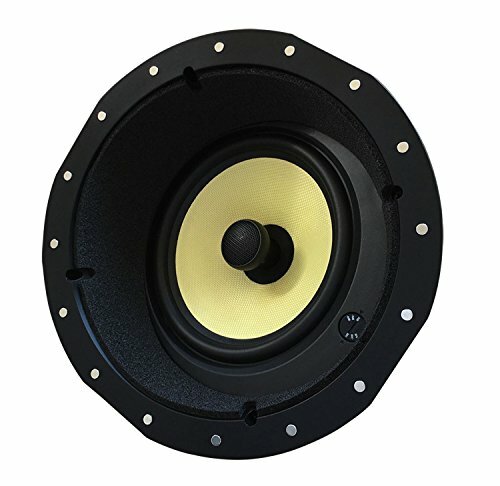 The Silver Ticket 8 inch 140-Watt 2-Way Angled In-Ceiling Speaker is a versatile speaker meant for anything from simple stereo applications to whole-home audio and theater systems. Suitable for 5.1, 6.1, and 7.1 home systems. The woofer cone is woven fiber to ensure high-quality, long-lasting sound that will bring movie action and music vocals to life. The high-grade rubber edge allows for true audio accuracy and quality that will last. The 25mm silk dome tweeter pivots for micro-tuning of the sound placement. Included above and beyond competitors is the extra heavy weight, high-strength magnet with its field of energy perfectly tuned with the voice coil - it's all about true efficiency. What does this all mean? - It means you get an excellent speaker that is loud, but not noisy. The speaker will not sound harsh when turned up; it maintains excellent clarity at all volume levels. This speaker is designed for quality and durability and is angled to direct the sound exactly where you need it. The accent trim around the edge of the speaker provides a clean appearance so you don't have to be a professional to install it. The flip-lever quick-mount system makes installing the speaker easy and secure. Each box also includes a wall hole cut-out template and paint masks. The Speaker is 8", Please note that the CUTOUT size is not 8". The speaker will NOT fit in an 8" hole.